You don't have the option to "hold it till maturity", so you are invariably exposed to interest rate risk, and as a consequence, you will probably gain or lose on your principal in the end. Isn't it better to invest in individual bonds, where if things go sour with the interest rate, you can hold them till maturity and recover your full principal? What if you have a small sum to invest in bonds? I'm not sure one could build a diversified portfolio for a few thousand dollars or less. Secondly, for some areas like junk bonds, it may be easier to use professional management to select which bonds are worth holding compared to others. Another point is that there can be mark-ups in bonds and thus it isn't necessarily that you are making more in trading bonds assuming one is buying bonds on the secondary market that may not be as liquid as a mutual fund. Bond funds like IEF and TLT invest in bonds of a certain duration. The IEF fund invests in Treasury bonds of 7-10 year maturity. The TLT invests in Treasury bonds of 20 or more years of maturity. Note that these bond funds are investing in bonds where the number of years left for the bonds to mature match the target maturity for the fund. This means the IEF fund can be holding 30 year bonds where there is only 7-10 years left until they mature. Those 30 years bonds are now essentially 7-10 year bonds. A bond fund is continually selling bonds that age out of the target maturity for the fund and buying bonds that meet the required maturity. In your question you mention purchasing an individual bond and holding it to maturity. As you mentioned, this is not the same as purchasing a bond fund. When you purchase a bond your bond will fluctuate in value compared to other bonds with similar number of years left to maturity. It would be similar to holding bond funds of different target maturities at different points in time as the bond matures. 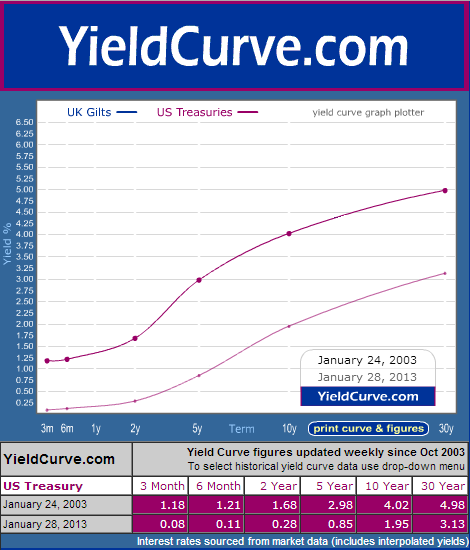 The chart below shows the yield curve for treasury bonds in 2003 and 2013. If you purchased the IEF fund in 2003 you would be speculating on the change in the 7-10 year section, and only the 7-10 year section, of the yield curve (by the way, you would have done well since bond prices move inversely to bond yields). If you purchased a 10 year bond in 2003, and held it for 10 years, your bond would now be competing with bonds of 3 months and less maturity. You would be speculating on different points of the yield curve as your bond aged. If I buy bonds near the maturity date, is it a short term zero risk investment?